PNY Technologies, worldwide leader in computer peripheral and memory products has released the stylish and versatile Multi-function card reader that virtually supports any type of memory card on the market, and also unveils the 4 ports USB 2.0 Hub. The USB Media Hub stores, organizes and presents an accessible route to all the digital files and data from the various devices connected. The USB Hub is a perfect solution for the users to enjoy their media through a user friendly interface and eliminate the restricted access of limited ports in computers and laptops. The PNY Multi-function card reader supports all the popular memory cards available in the market, including SD, SDHC, MMC, MMCplus, MS, MS Pro, MS Pro Duo, xD, CF, M2, Micro SD, Micro SDHC and more. The USB 2.0 interface allows for easy plug and play installation and its high speed performance ensures up to 10K read / write speed facilities. The built in USB cable ensures hassle free and smooth operation of transfer and storing of memory. It stores neatly into a slot on the bottom of the reader. 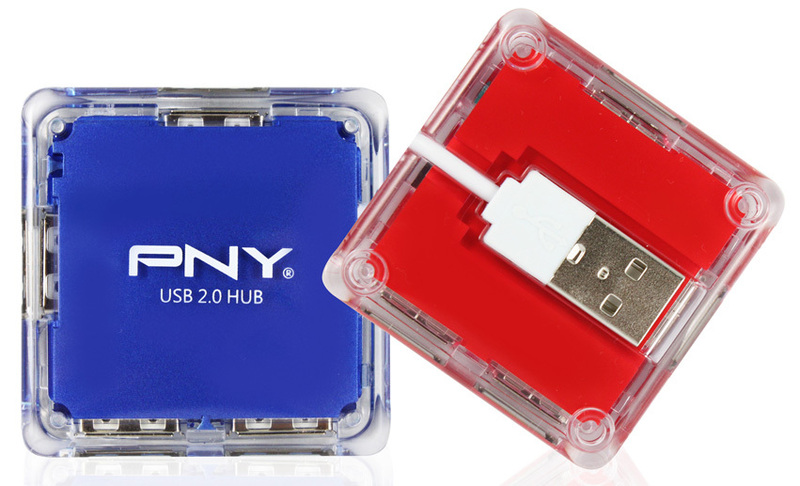 PNY USB Hub can accommodate up to 4 peripheral devices and the sleek and colorful design makes it possible to use the hub anytime and anywhere. With lightning speed data transfer of 480 MB/s and USB 2.0 and USB 1.1 interface support, the USB Hub controller is the ultimate way to expand your growing digital media storage and file sharing experience. The cleverly designed USB Hub and Card reader fashionably complements the devices in eye catching and preppy colors available in red, and blue. The PNY Card reader and USB Hub works compatibly with all versions of Windows operating system and Mac version and comes with a limited warranty of 2 years form the date of purchase. Whether you are transferring or copying simultaneously from card to card or connecting multiple peripheral devices directly to the computer, the PNY Card reader and USB HUB is the ideal device for anyone desiring functionality and style on the go. MSRPs: Est. US $10. For more information, visit the product pages of 4-port USB hub and 12-in-1 card reader.